Whenever we went out to the field for training, our squad leaders had to bring “potable water.” Potable water is what you can drink and fill your canteens with. The field on Fort Lewis was always way out in the middle of nowhere, so we always had to bring out water and food. There wasn’t anything like water in the MREs, though at the time, they had powdered sweet drinks that could be added to water. The first way was our own personal canteens. We carried one quart canteen on our equipment belt, and that was supposed to be full before we went to the field. In Desert Storm, we had two 2 quart canteens—it was wearing water balloons stuck to our hips. I hated drinking out of my one quart canteen. They were always used when we got them from central issuing, and the previous owner of mine had added the MRE powdered drink to the water. The taste had leached into the plastic, so when the water warmed up over the day, the water would have this vague flavor of cool aid. Yuck! Our platoons also brought out water in five gallon containers. Amazingly, it’s for sale on Amazon! This is exactly what they looked like. My squad would fill up some and put them in the back of a CUCV, which was a vehicle we used after the jeep and prior to the hummers. It looks kind of like the suburban, except camouflaged in dull green colors. When the container was full up, it was a two person job to fill a canteen. One tipped the container while the other held the mouth of the canteen to the mouth of the containers. Water usually managed to spill. The sergeants would also take one and turn it upside down so the spigot was on the bottom, then set it on a table by the latrines so we could wash our hands. During Desert Storm, a lot of times this was one of those ubiquitous bottled waters that were everywhere. The last way we brought out water was at company level—a lyster bag was set up. I tried using the term in something, but no one knew what the heck one was. It looks like a canvas punching bag dangling from a frame, or a tree branch. It holds 36 gallons of water and was always sweating with ice cold water. A picture is here. The sergeants were always making sure we drank water. One of the women hated water and just drank coffee. She refused to drink water when we were in Desert Storm and ended up getting it in her record that she had been told she needed to drink water. She did end up dehydrated and on an IV at one point because she didn’t get enough liquids. Even just in a normal field activity, you can sweat off a lot of water, so it was always important to have more water nearby. My trip out to Log Base Alpha signaled a change in the progress of Desert Shield, hammering in the seriousness of what was happening. Log Base Alpha was a transfer point for all the ammunition, located in King Khalid Military City (KKMC), northeastern Saudi Arabia. Our company had been running huge convoys of trailers loaded with artillery out here. It was nearly a ten hour trip one way, so the drivers would have to stop, sleep for a while, and then head back with empty trailers. It was also the closest I would get to what would be the front line. “Mostly, everything was flat. In the beginning, we saw camel farms. Men herded them in long lines. Black camels, brown camels, white camels. Even baby camels, still sucking Mom’s teats. I would be running the fuel point for the incoming convoys for the next week. Then my relief would come up on one of the convoys, and I would return to my company. Members of our maintenance platoon were also there to do any repairs on trucks, as needed. I came in after dark with one of the convoys — no idea what time it was. Tents were set up for the drivers, but I was the only one who stayed in it. The drivers stayed with their trucks for a few hours sleep before making the ten hour trip back. It was cold when I arrived. We were headed into winter in the desert, and the nights turned cold. Probably not cold by the standards of Virginia, where it is forty degrees as I write this. But all I know was that I was so cold, and I slept in an empty tent, huddled up in my sleeping bag on a cot. In the morning, I found that Log Base Alpha was spartan. Pretty much, the Army had tossed up tents and added showers and latrines, and that was it. We didn’t even have a mess hall. That was some distance away, on a very bumpy road. We were so out of the way that the Air Force was the one providing the food, since they had the means to fly it in. Before they gave it to the mess hall, they raided it for the best stuff. The result was that my first dinner meal was chicken and rice, which meant it had a lot of rice and few splinter-sized pieces of chicken because the cooks had to make what little they had stretch. Between the bumpy ride and the lack of food available, we decided (with disgust) that MREs would be better. So, my week there, I ate MREs three times a day. Eaten straight out of the package, as I did then, it wasn’t all that good. Now, in this barren, isolated place, I had a surprising item available: MRE Bread. It was a soft, and surprisingly delicious bread that came in a plastic pouch. Somehow, maintenance platoon had gotten hold of several boxes. Heat the pork patty, or its companion, the beef patty, in some water to rehydrate it, put it between the bread, and suddenly I had a burger. We also had MRE heaters, which I hadn’t seen before either. Where were all these things coming from? Why hadn’t anyone thought to give it to us before? Having hot MREs helped make them taste better, a whole lot better. The flameless heaters used a chemical reaction to generate it. Each packet had a heater pad, along with iron, magnesium, and salt. All we had to do was add water and insert the entrée pouch. Then prop it up so it didn’t spill and wait about ten minutes. I just had to be careful opening it for my food pouch, because it got pretty hot! One of the guys was also able to get hold of B-rations, which was dehydrated food in cans. They’d gotten steak — not a t-bone, but a cheaper cut of meat. The guys added water and cooked them up on the kerosene heaters. We were actually eating pretty good, considering the conditions, and it was a break from the normal food we were eating. Then my week was up, and I was on my way back to rejoin my company, now at Camel Race Track where we’d also finally met up with our war battalion. Army food’s always been known for how bad it is. Just watch any episode of MASH and Hawkeye complaining about the food. But I’ll let you in on a secret: When I was growing up, my mother eliminated using salt when she cooked. The meals were so bland that when I ate my first army meal in Basic Training, I was shocked at how good food could taste. That soon would change, especially during Desert Storm. The war not strained the logistics side of shipping food out to us with hot weather and multiple services vying for items, but also strained the abilities of the soldiers cooking the meals. There were times when Hawkeye ate better than us! We got hot food for both these meals. I no longer remember what was served for breakfast, but it was probably the standard food and didn’t change much. Dinner had a protein, a green salad, and a desert. It seems like there should be one more thing, but I don’t remember. I do remember that I never liked the salad because it was very bland. At the end of the line, we also received a can of soda. Those were very strange. They were the name brands like Coke and Pepsi, but they were the Saudi Arabia version. The cans had the name in Arabic on them, and they were short. Our cans 12 ounces, and these were about half. Now, over two decades later, the companies are selling the smaller cans! Bangladesh contractors cooked the meals and served them to us. I remember them as nice guys. They were friendly with all the soldiers because that just seemed like who they were. Sometimes they would give me an extra piece of yellow cake (chocolate frosting … mmm). The meals were very repetitive. The menu only consisted of three entrees for dinner, so we got chicken every three days. This was probably due to the availability of the food. The logistics of getting food out to us on the desert was very challenging because anything fresh spoiled very quickly. Still, it was hard for us to not have any variety, and it got old very quickly. Everyone complained about the meals and especially about having so much chicken. As it turned out, these were actually the best meals we ate over there. We would have much, much worse later. The lunch meal consisted of MREs, or Meals Ready to Eat. We called them Meals Rejected by Ethiopia (at the time people were starving in Ethiopia). The MREs consisted of 12 packets of different meals like Chicken Ala King, Spaghetti with Meatballs, and scary food like Omelet with Ham. Each packet had 1,200 calories (really!) and consisted of an entree, a side, crackers with a topping (peanut butter, jelly, or cheese), a desert or snack, and powdered punch. Hot sauce came in only a few of the packages and was always the most popular item because it hid the flavor. We would file into the mess tent and wait in line. At the end of the line, one of the cooks stood next to a stack of MRE boxes and handed them out. If they didn’t do that, greedy soldiers would rifle through and grab all the popular ones, leaving the ones no one liked for everyone else. That way, everyone had a fair chance of getting a good meal once in a while — but only once in a while because most of them weren’t that good. The tables started accumulating MRE discard piles. The discards were usually the dehydrated fruit, crackers, peanut butter, cheese, some entrees, and occasionally the entire MRE package. So after we sat down and inventoried what we had, then we checked out the piles for anything that was better. I always liked the fruit, though most soldiers didn’t, so I could usually get it. The fruit came in a square block about half an inch thick and had the texture of frozen cotton candy. As odd as it sounds, I liked the texture because it was slightly crunchy because most of the food was soft and mushy and the crackers didn’t have any moisture at all. Most of us passed on the cheese, too. It didn’t taste too bad, but the texture was rubbery and unappealing. Pork with Rice in BBQ Sauce – I never cared much for this. The BBQ sauce had a metallic taste to it that was very unappealing, and instead of flavoring the pork, it dominated the pork. Corned Beef Hash – Meh. Chicken Stew – I liked this, but most soldiers did not. So if anyone abandoned the entree or wanted to trade, it was mine. Chicken a la King – Again another one I liked and most people did not. This was my favorite among the chicken ones. Chicken with Rice – Again another one I liked and most people did not. This was my third favorite because of the texture of the rice. Omelet with Ham – Seriously, no, never. Ham Slice – a slab of meat. I didn’t think much then about the impact of how the food looks, and the appearance of this just turned me off. Beef Stew – This also didn’t look really good. Flavor-wise, meh. Meatballs with Tomato Sauce: The sauce was a deal-breaker for me. It just didn’t taste good. The proportions were off; it had too much sauce and not enough meatballs. Tuna with Noodles – Meh. Just bland, both in taste and color. Escalloped Potatoes with Ham – This was only slightly better than the Omelet with Ham. That’s not saying much! Okay, that was scary. I just typed up this list and there’s only one in here that everyone liked and a whole lot that no one cared much for. I was surprised at typing this list and realizing that a lot of the appeal was not just taste, but the colors and textures (thanks to the cooking shows where I’ve learned a lot about food!). 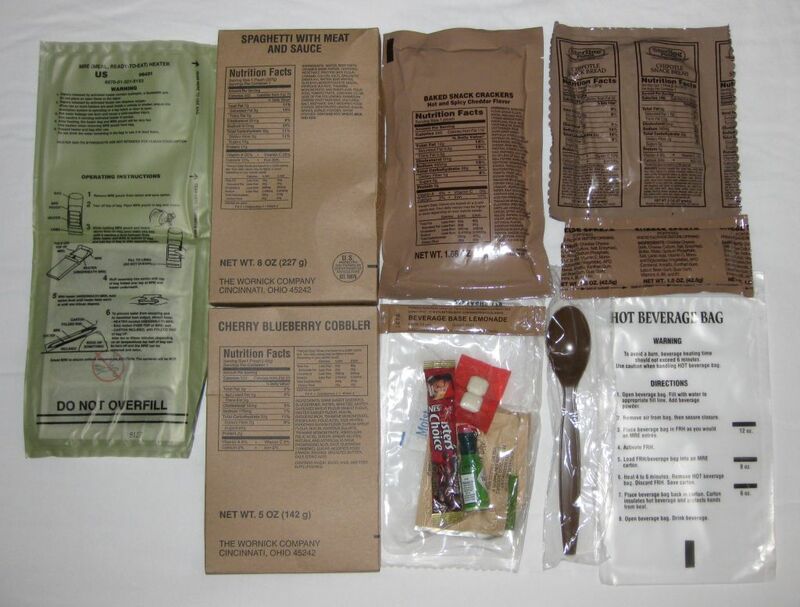 It seemed like the military had thought of the MRE not as deployment food where a soldier might eat one every day, but as food for training exercises. Soldier goes out for a week, eats five meals, and comes back home. So the meals have evolved quite a bit from the two releases that we ended up eating in Desert Storm. In fact, the military learned a lot about them in those early days. The MREs didn’t last as long as they thought the meals would, nor were they quite as hardy in the hot desert weather. What everyone learned from Desert Storm, the military took back and used to change the MREs for future soldiers, so we broke new ground in food. We ended up being an unintentional experiment. The expandable cargo pocket is big enough for a soldier to put an MRE in it. Or a paperback book, in my case! There are priorities. The fly uses buttons instead of a zipper. Zippers break and then the pants have to be sent out for repair. But a button can be fixed with a needle and thread in a few minutes. Lots and lots of pockets for putting anything and everything inside. On the pants, there are two cargo pockets, 2 front pockets, and 2 back pockets. On the shirt, there are four more pockets. The pants tuck into the boots. That means no hem alterations. That was probably a good thing since the uniform was way too big on me. I could cover my feet entirely with the hems and still have cloth left over. Long sleeves, which were loose enough to be worn down in winter or rolled up during the summer. No need to have a short sleeve version and a long sleeve version when one would work. A t-shirt worn under the shirt. During the Civil War era, women used detachable collars and under sleeves to keep the dress from wearing out. The t-shirt serves the same purpose. Washable in the washing machine. Granted, I usually sent it out and had it starched — so much easier than me spending time to do it (and technically, it wasn’t supposed to be starched, but everyone always expected creases). It’s quite different from buying clothes at the store. I find clothes that are “hand wash only,” or “dry clean only.” Or, like a sweater I have, I have to detach the fur collar before I can wash it. But a soldier may have very little choice about what how she gets the uniform cleaned. Next up will be “living Quarters in desert storm” so tune in, same military channel, same military time tomorrow. One of the things that can really wreck morale or get soldiers complaining are meals. 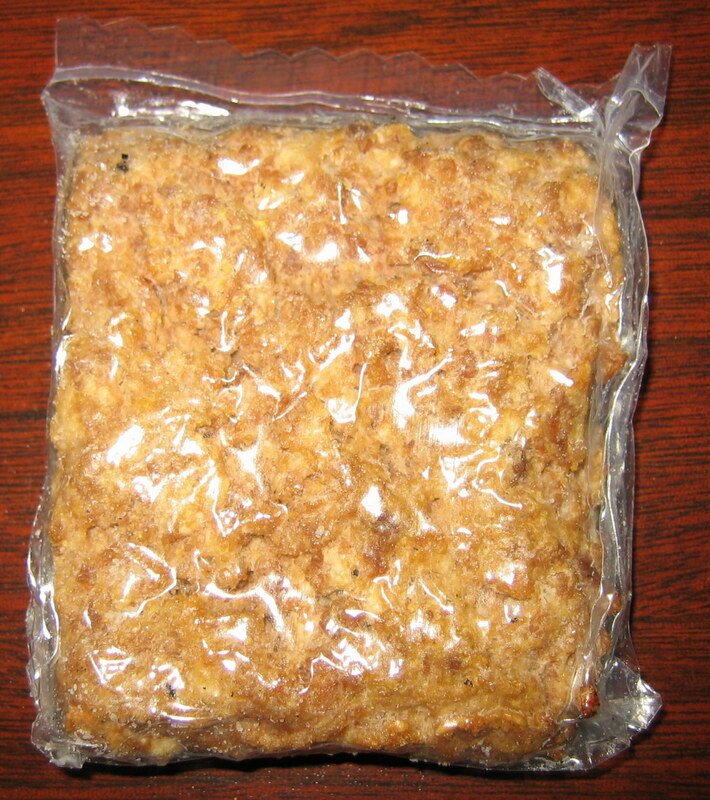 The army generally has thought of feeding soldiers as giving them “three squares.” I’ll bet if you’re thinking about eating, you’re either looking through the fridge for something to make or considering dashing off to a restaurant. If you choose the restaurant, you can go through the menu and find what you like. Every Saturday, I go to IHOP for pancakes. One time, I asked them if I could add bananas. I was thinking as a topping, but the server asked me if I wanted it in the pancake. But a soldier gets whatever they’re given, regardless of whether they like it, and that’s what they eat. I remember my first introduction to the MRE — officially, meals-ready-to-eat, but then also called meals rejected by everyone, meals rejected by Ethopia, meals rejected by the enemy — well, you get the idea. I remember pulling out the Pork Patty and staring at it. It was dehydrated and then shrink wrapped. What did you do with it? I think a hockey puck would have been more appetizing. It definitely didn’t taste any better than it looked. I think at that point, most of the experience of soldiers eating MREs was when they went to the field. We’d have them for lunch, and you didn’t get to pick which one you wanted. A cook stood at the stack of boxes and handed you one. Sometimes there were cheers: “I got spaghetti!” which was pretty good, or “I got the omelet.” Yes, a dehydrated omelet. Just so yummy. There were a few that could be improved with other ingredients like nacho cheese dip, but not that one. This is what the contents of the MRE looked like after you opened it. Though this picture shows a “heater” on the left and a hot beverage bag, that was not part of the actual package. I never even saw the hot beverage bag, and the heater was a luxury item. The meals usually came with the entree; a side item which might be dehydrated peaches or rice; peanut butter, jelly, or a rubbery white cheese; and a cookie or cake for desert. Sometimes we got hot sauce, which was a hot item (pun not intended) because everyone wanted to use that to mask the MRE taste. Desert Storm was what convinced me the army didn’t think beyond feeding soldiers during the field. At that time, the military had just issued the next line of MREs. Our daily meals consisted of a hot breakfast and a hot dinner. Lunch was an MRE. No choices, of course, which was actually pretty fair. Otherwise, some people would have always taken the favorite ones that everyone liked and no one else would have had a chance to get them. Soon, in the center of the dining tables, a pile of rejected MRE parts would begin to appear. I’d go through those because there were some things that most soldiers didn’t like but that I did. The dehydrated fruit was like eating Styrofoam, but it tasted pretty good (and for anyone who’s had one and just snorted, all I need to say is Omelet with Ham or Escalloped Potatoes with Ham). Anything that was desert I claimed. Sure, the cookie or the cake might be really dry, but taste-wise, it was often a luxury to eat. When I was at Eskan Village, I was lucky to have access to a small shoppette. I found some nacho cheese dip for potato chips and used that to improve on the flavors. It did help the Escalloped Potatoes so they were tolerable, but nothing could help the Omelet with Ham. That was beyond hope. But the weirdest part was when I went to Log Base Alpha right before the war started. It was pretty isolated territory, and we quickly discovered that the mess hall was really, really bad. By choice, we went to MREs three times a day. But because of our location, we had the older MREs, like the ones I’d eaten in Basic Training. It was like they were new and exciting things because we hadn’t been eating them all along! Better still, we’d managed to get a pallet of MRE bread, which was really good. Cut the bread in half, hydrate the pork patty, and it made a pretty good sandwich. Once Desert Storm ended, the military realized that they needed to pay attention to how the meals tasted, and since then, they’ve been developing meals like pizza. I’ve never had the pizza MRE. What do you think? Could the army make a dehydrated pizza actually work? Next up will be “what it’s like to wear a Gas mask” so tune in, same military channel, same military time tomorrow.